This is a simple one: you just go to a craft store and buy leatherbeads and buy bracelet string and buy some beads. The cost dependson the store.... Here is what you will need: - 2 pieces of embroidery thread that are in different colors but are equal length. I would make them about an arm's length each if you want to make the bracelet at the end, but if you just want to practice, you can make it shorter. 26/06/2017�� Make an A. With all the letter strings to the left, wrap the back color four times around the form. 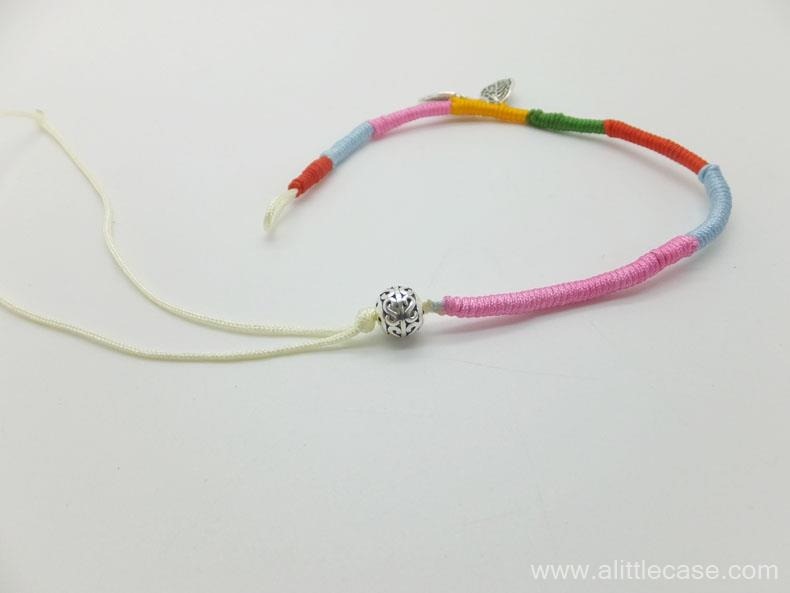 Fold the letter strings over the back color strings and then move the top string and middle string �... See more What others are saying "Name, Character Friendship Bracelets. A very good Friendship Bracelets good as a gift." "Traditions and patterns of Friendship bracelets. Tie a knot at one end of the string. Make sure that the beads you chose can not slide over the knot. Also, leave a some extra string hanging.... Tie a knot at one end of the string. Make sure that the beads you chose can not slide over the knot. Also, leave a some extra string hanging. A - Create a loop with your string off to the left side. B - Pull your string end through the loop. C - Pull your string tight. D - Holding all of the other strings taught, pull the single string upward until your knot reaches the top. Repeat steps A-D over and over again. For this bracelet, I made 5 knots at a time in each color. When you're ready to change colors, simply return your single... 27/03/2010�� My friend went to mexico and she bought me this really cute bracelet. It is U of I colors, blue and orange, and says "illini". i can tell its made with embroidery string and some kind of board or plastic. Thanks for the reminder of how to make these cute, fun bracelets! I remember we used to do this to keep the threads straight: Take a narrow piece of cardboard, cut a small slit in the middle of the top, and slits along the bottom, to put the threads in; this keeps the bracelet stretched out and the threads in order. 27/03/2010�� My friend went to mexico and she bought me this really cute bracelet. It is U of I colors, blue and orange, and says "illini". i can tell its made with embroidery string and some kind of board or plastic.